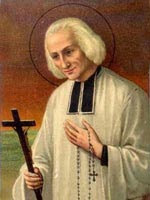 Although at least one biography of St. Jean Vianney tried to play down his encounters with the "Grappin" - his name for the Evil One, the Saint's experiences of the Devil, including the loud banging on the door, the whispered nickname, "Potato eater!" and having his bed set on fire, show us that there is an evil reality which is personal. Not only is there a Devil, as the official teaching of the Church attests, but there are evil spirits which may be identified as fallen angels or demons. I have just finished reading a book entitled, "The Dark Sacrament". It presents several real-life cases of possession, "haunting" and oppression in Ireland, and the cases are taken from the experiences of two exorcists, one an Anglican priest, the other a Catholic monk. More than one of these cases involved the abuse of children by Catholic priests. Evil spirits are not only involved in the actions of those priests - pushing them towards evil and obviously encouraging sexual desires that we would regard as disordered, but spirits often badly affect the lives of the abused - the victims. I have personally dealt with some abuse victims who needed deliverance, but there are some sad people out there who are victims of clergy abuse, and some of them are in need of formal exorcism. I quite understand the reticence of some priests - and more worryingly, bishops - to accept this. To be honest before I was appointed exorcist, I would have though much of what I now know about or have experienced was the stuff of fairy tales. Unfortunately much of it is real. The film "The Exorcist" did not tell the whole truth, to the extent that it gave many people a false idea of both exorcism and exorcists, BUT, there IS some truth in that film (it was, after all based on a real case). It is interesting that Fr. Amorth, the famous exorcist of Rome says this is his favourite film. Those who doubt that demons are involved in sexual abuse should read the book. I have no idea how many Irish priests have been affected by this kind of thing. Some cases turn out to be false, but then there are others that we know little or nothing about because they are simply not brought to light. Some priests who have been involved in abuse die before their sins are discovered. There may be other problems following from that! To my mind, abuse cases need to take account of the presence of evil and exorcists should be consulted. I have said this before and been ignored. Perhaps it is only when people actually witness the presence of evil (and that sometimes means seeing something as well as hearing something) they will be convinced of its reality, but if I am not hallucinating or a pathological liar, and if other exorcists - who were chosen by their bishops because they were regarded as balanced and trustworthy - witness to the reality of these things, then it is about time those involved in dealing with abuse victims and perpetrators took notice.